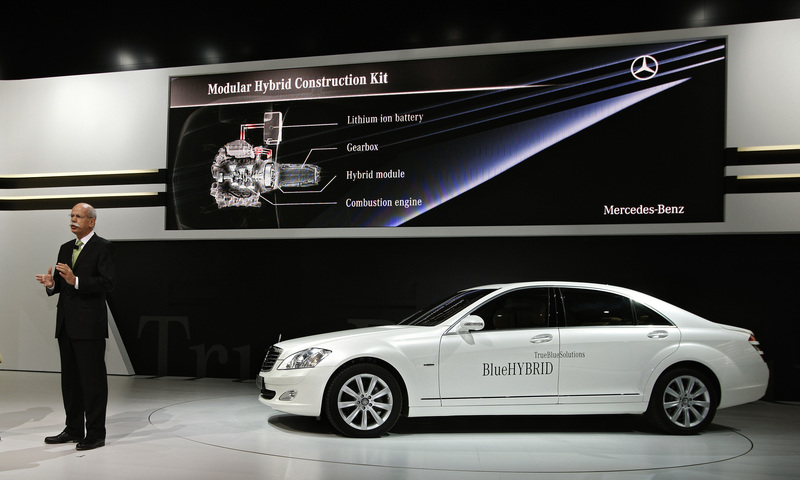 1 Comment on "Mercedes-Benz S 400 BlueHYBRID"
Mercedes-Benz USA is also promoting their new Bluetec 50-state clean diesels, which they hope will account for at least 15 percent of its SUV and cross-over sales. The three new Bluetec vehicles that go on sale in October with a new V-6 diesel are the 2009 320ML crossover, GL SUV and the R-class crossover. Mercedes-Benz is pushing the diesels as fuel efficient alternatives to the current line of gas powered vehicles; diesel is 20-33 percent more fuel efficient than a comparable gas model. Also, Mercedes-Benz USA calculates the payback period is about two years faster than that of a hybrid gas-electric SUV. More on the Mercedes-Benz Bluetec models on AMG Market here. “EPA is considering Mercedes’ assertion that the BlueTecs should be in the same category as hybrids that qualify for the federal Alternative Motor Vehicle Credit. Mercedes officials seem confident the diesels will, in the eyes of the EPA, be seen as equally “clean” as hybrids (reference: edmunds.com).